Set the lens focus mode switch to <MF>. Focus by turning the lens focusing ring until the subject looks sharp in the viewfinder. You can shoot up to approx. 5 shots per second. This is effective for shooting a child running toward you or capturing different facial expressions. Press the <drive mode> button. Select <Continuous Shooting.> Press the <L/R> key or turn the <main dial> dial to select <Continuous Shooting> continuous shooting, then press <set>. Take the picture. 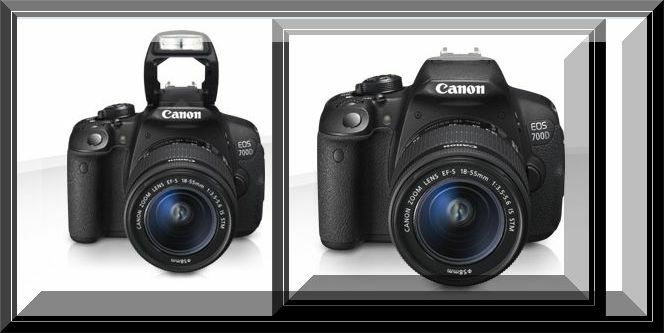 The camera Canon 700D shoots continuously while you hold down the shutter button completely. 1. Also set the AF operation matching the subject. When AI Servo AF is set, focusing will be continuous during continuous shooting. When One-Shot AF is set, the camera eos rebel T5i will focus only once during continuous shooting. 2.Flash can also be used. Since the flash will require recycling time, the continuous shooting speed will be slower. The maximum continuous shooting speed of approx. 5 shots per second is achieved with a shutter speed of 1/500 sec. or faster and at the maximum aperture (differs depending on the lens). The continuous shooting speed may decrease due to shutter speed, aperture, subject conditions, brightness, lens, flash use, etc. With the following lenses, 5 shots per second is achieved with One- Shot AF and the Image Stabilizer turned off: EF300mm f/4L IS USM, EF28-135mm f/3.5-5.6 IS USM, EF75-300mm f/4-5.6 IS USM, and EF100-400mm f/4.5-5.6L IS USM. In AI Servo AF operation, the continuous shooting speed may become slightly slower depending on the subject and the lens used. When the battery level is low, the continuous shooting speed will become slightly slower. You can select the AF (auto focus) operation characteristics suiting the shooting conditions or subject. In Basic Zone modes, the optimum AF operation is set automatically for the respective shooting mode. On the lens, set the focus mode switch to <AF>. Press the <play Af> button. [AF operation] will appear. Select the AF operation. Press the <left/right> key or turn the <main dial> dial to select the desired AF operation, then press <set>. Focus the subject. Aim the AF point over the subject and press the shutter button halfway. The Canon rebel T5i will then auto focus in the selected AF operation. Suited for still subjects. When you press the shutter button halfway, the camera will focus only once. When focus is achieved, the dot inside the AF point achieving focus lights up briefly in red, and the focus confirmation light in the viewfinder will also light up. With evaluative metering, the exposure setting will be set at the same time focus is achieved. If focus cannot be achieved, the focus confirmation light in the viewfinder will blink. If this occurs, the picture cannot be taken even if the shutter button is pressed completely. Recompose the picture and try to focus again. If [Beep] is set to [Disable], the beeper will not sound when focus is achieved. This AF operation is suited for moving subjects when the focusing distance keeps changing. While you hold down the shutter button halfway, the subject will be focused continuously. The exposure is set at the moment the picture is taken. When the AF point selection is automatic, the camera first uses the center AF point to focus. During autofocusing, if the subject moves away from the center AF point, focus tracking continues as long as the subject is covered by another AF point. AI Focus AF switches the AF operation from One-Shot AF to AI Servo AF automatically if a still subject starts moving. After the subject is focused in One-Shot AF operation, if the subject starts moving, the camera will detect the movement, change the AF operation automatically to AI Servo AF, and keep tracking the moving subject. When focus is achieved with AI Focus AF with the Servo operation active, the beeper will continue beeping softly. However, the focus confirmation light in the viewfinder will not light up. Note that focus will not be locked in this case. In Basic Zone modes, the camera will normally focus the closest subject automatically. Therefore, it may not always focus your target subject. In the <P>, <Tv>, <Av>, and <M> modes, you can select the AF point and use it to focus the target subject. Press the <AF> button. The selected AF point will be displayed on the LCD monitor and in the viewfinder. Use the <navigation> key to select the AF point. While looking at the viewfinder, you can select the AF point by turning the <main dial> dial until the desired AF point lights up in red. When all the AF points light up, automatic AF point selection will be set. The AF point will be selected automatically to focus the subject. Pressing <set> toggles the AF point selection between the center AF point and automatic AF point selection. Aim the selected AF point over the subject and press the shutter button halfway to focus. When shooting a portrait up close, use One-Shot AF and focus the eyes. If you focus the eyes first, you can then recompose and the face will remain sharp. The center AF point is the most sensitive among the nine AF points. The center AF point will first be used to focus the subject. During autofocusing, if the subject moves away from the center AF point, focus tracking continues as long as the subject is covered by another AF point. The AF-assist beam cannot be emitted with AI Servo AF operation. The effective range of the AF-assist beam emitted by the built-in flash is approx. 4 meters/13.1 feet. In Creative Zone modes, when you raise the built-in flash with the <flash> button , the AF-assist beam will be emitted when necessary. High-precision AF with vertical and horizontal lines detection is possible with the center AF point, in addition to the cross-type focusing (vertical and horizontal lines detected simultaneously). The remaining eight AF points enable cross-type focusing in the same way as when using lenses with maximum apertures up to f/5.6. Except with the EF28-80mm f/2.8-4L USM and EF50mm f/2.5 Compact Macro. The following lenses enable only horizontal-line sensitive focusing with the three AF points on the left and the three AF points on the right and only vertical-line sensitive focusing with the top and bottom AF points. Cross-type focusing is possible only with the center AF point. With One-Shot AF, focus an object at the same distance as the subject and lock the focus before recomposing.